sorry for the lack of interesting posts lately. I’ve been so busy working at the BBC story fest sessions and getting ready for Craft Fest I haven’t had a chance to get all the lovely posts I’m planning done! I’ll get there next week I promise! 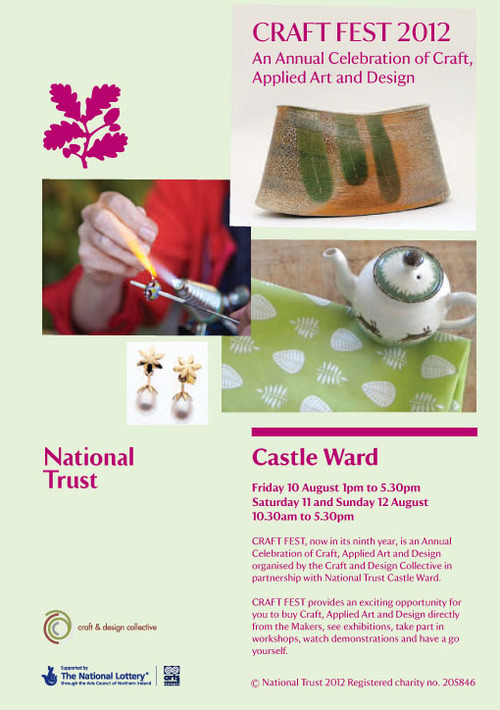 This weekend though I’m taking part in Craft Fest at Castle Ward in Strangford. Its the second year I’m doing it and I’m really looking forward to it. When I did it last year it was the first proper big craft fair that I’d done and it really inspired me - meeting the customers and seeing what sort of things the were looking for and also meeting the other exhibitors, it really made me think about the sort of things I’m making. So if you’re free this weekend do try and head down and take a look. There will be loads of different stands as well as workshops and demonstrations and on top of all that you can take a tour round the big house - where there is also an exhibition of work going on - My book Until Further Notice will be part of the exhibition.